U.S. warship challenges Chinese claims in South China Sea. 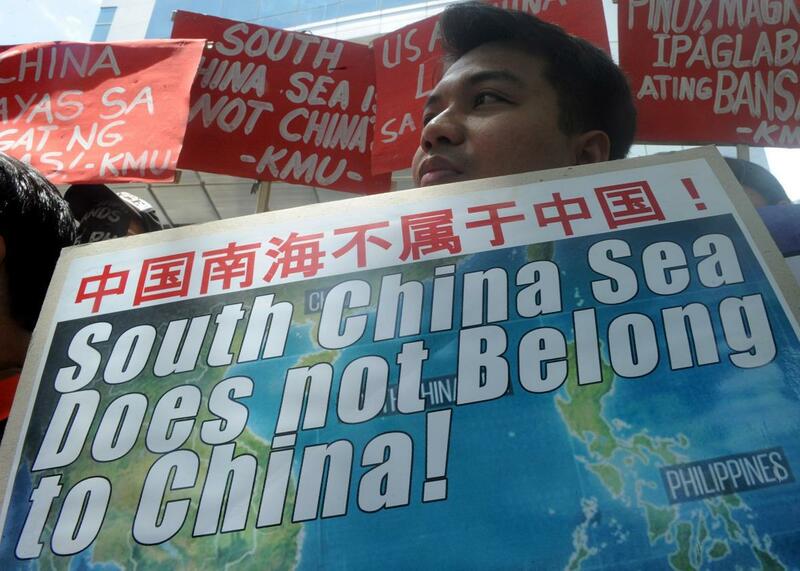 A protester holds a placard at a rally in front of the Chinese Consulate in the financial district of Manila, Philippines, on July 7, 2015. In a direct challenge to Beijing’s territorial claims in the South China Sea, a U.S. Navy destroyer on Tuesday passed within 12 nautical miles of the artificial islands that China has been constructing on a disputed reef. China claims nearly the entire sea as its maritime territory, conflicting with overlapping claims by Brunei, Malaysia, the Philippines, and Vietnam. China has been bolstering its claim by constructing thousands of acres worth of artificial islands on partially submerged regions. International law allows countries to claim waters within 12 miles of their territorial coasts, but the U.S. doesn’t recognize China’s claims as legitimate because the reefs on which the islands are built are partially submerged. Chinese officials have denied that the islands are aggressive in intent, which the U.S. says is contradicted by satellite images showing airstrips that could be used for military purposes. The Pentagon has been pushing for months for a mission like this one to assert U.S. freedom of navigation in the area, but the White House has reportedly been reluctant due to the inevitable backlash from China, particularly ahead of last month’s state visit by Chinese President Xi Jinping. The U.S. military has challenged China’s territorial claims before. In 2013, two B-52 bombers flew through an “air defense identification zone” declared by China over another set of disputed islands in the East China Sea. And it cuts both ways: Last month, a group of Chinese naval vessels came within 12 nautical miles of the Alaska coast. That was technically legal as international law allows for “innocent passage” through another country’s waters, though it’s certainly the kind of thing China has objected to in its own waters. As Gordon Lubold of the Wall Street Journal explains, the U.S. did not claim innocent passage for Tuesday’s sail-by as that would imply recognition of China’s territorial claims in the South China Sea. The incident will get added to the long list of tensions between the U.S. and China. Beyond today’s complaints, there’s unlikely to be much of an immediate response from Beijing. China certainly isn’t going to give up its claims but it is also very unlikely to directly challenge U.S. ships in the area. Neither side has any interest in direct confrontation, but the risk of catastrophic error or miscalculation is very high.